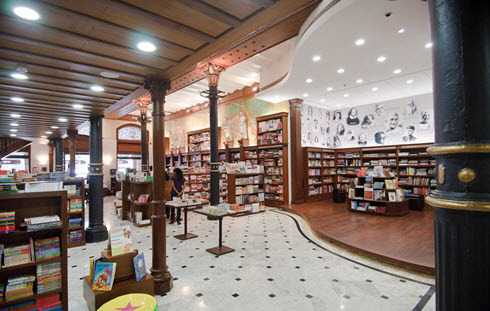 There are several ways to buy books in Mumbai. There are street hawkers everywhere, they sell their books vertically or horizontally off the street. I always find it difficult to go past, always thinking one of them might have something exiting I didn’t know existed…. But most of the time they sell the same books. Booker prize winners are plenty among them. Outdoor book market at Flora Fountain. 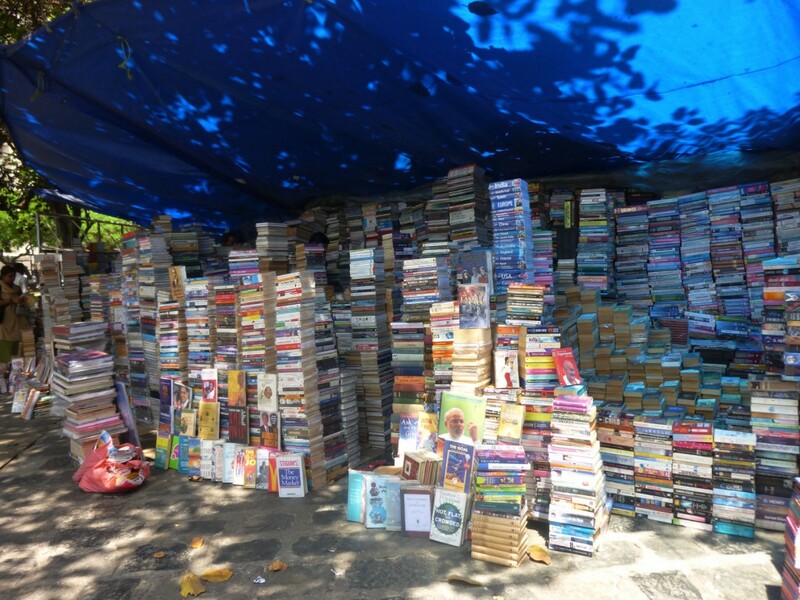 There is an outdoor book market at Flora Fountain, in the Fort area, South Mumbai. Insiders tell me the book market has lost its glory, and that may well be. Something tells me the market has been much bigger, and more of an attraction. The market has been there “always” and it’s not legal, of course. But it’s a nice spot anyway, and Fort is a great area. The books are stacked in piles and piles, it’s not easy to search through them without help. One could of course easily find the same books in a book store, save something really old perhaps – or a real gem… – but the heaps of books have a certain attraction. I’m not able to pass no matter how faded it is! 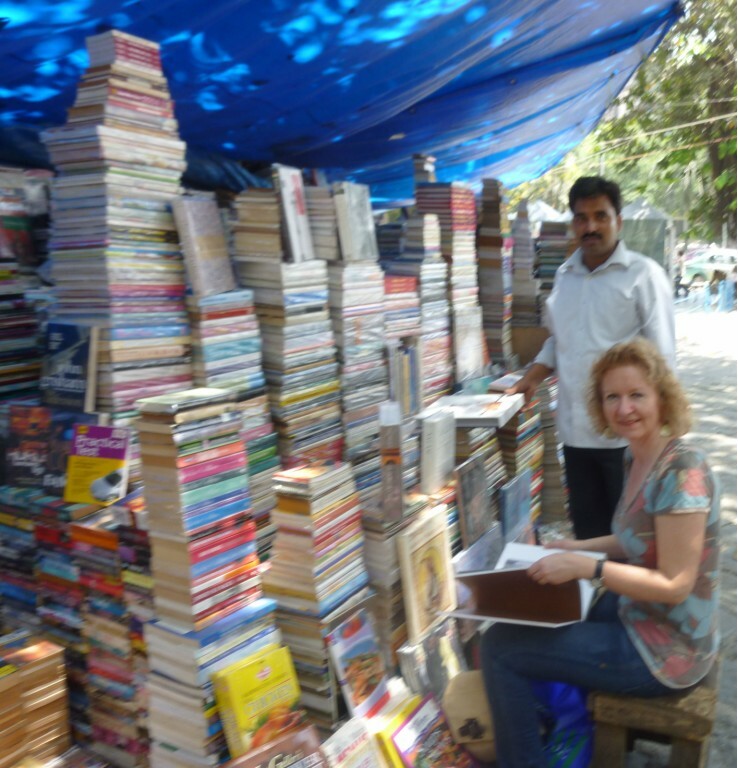 On the last day of my visit I decided to pay the book market a visit, I was looking for books about Mumbai in particular. And everybody was eager to help, and I did in fact find the one book a book store told me was sold out from the publisher; Mumbai; City of Gold by Gillian Tindall. And I found many more books, but my suitcase was already 21 kg. But I was given a little stool so that I could leaf through a great book about The Maharajas, too heavy – but now on my shopping list for the next visit. Arches at M. G. Road, these pavements are very welcome on a hot day! 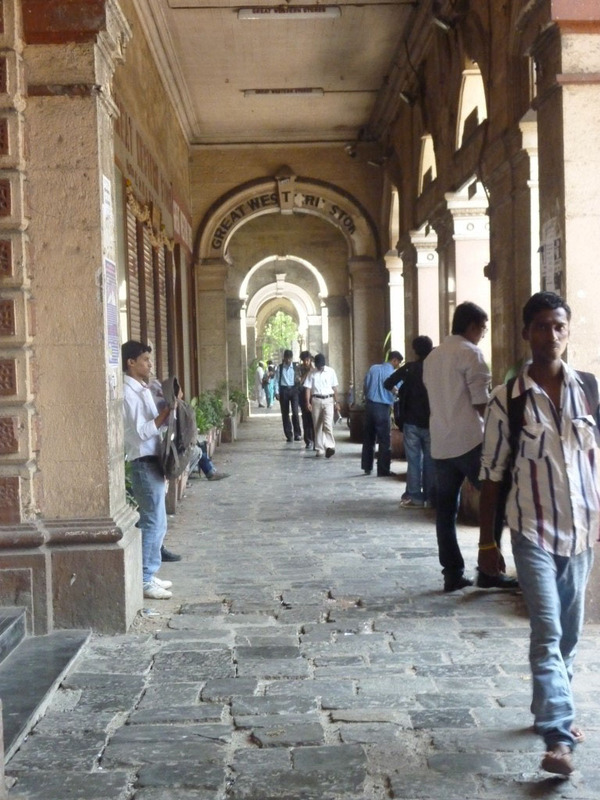 On my way back to Colaba, I strolled down the pavements of M. G Road, under the arches that give you a bit of much-needed shade. And suddenly I became aware of a book store. I went inside, and was very pleased by what I saw. A spacious room with an open first floor. Beautiful interior and shelves, all dark brown. Books laid out on tables. The whole room was screaming, but in a soft voice: buy books………. A man was constantly dusting the shelves with a big, soft light blue duster. I said to the nice, middle-aged man behind the desk that I couldn’t remember having seen the shop before, even though I can spot a books store miles away and I have walked M. G. Road many times. – We opened just recently, he said proudly, – three months ago. Kitab Khana it was called. Another favourite in Mumbai: Kitab Khana. And what’s more… at the back was a nice little cafe. The owner seemed to be everywhere, making sure the guests were well taken care of. Service was impeccable anyway. I had lunch there two days in a row; penne pasta, Pepsi and strong coffe. All tasted great except the Pepsi that tasted…Pepsi. Kitab Khana is on my “must visit again-list”. Definately!